Weeks of speculation have finally come to an end. The rotation shuffling that saw the A’s top four starters all in the running to make the opening night start over the past two weeks finally concluded when manager Bob Geren named Trevor Cahill his opening day starter this morning. Just last season, Cahill battled through spring for the fifth and final spot in the rotation before he finally found himself starting the season in Sacramento on a rehab assignment. Following his call-up Cahill was the A’s most consistent starter, earning himself an All Star selection and a ninth-place finish in Cy Young voting. Cahill will face reigning Cy Young winner Felix Hernandez and the Seattle Mariners on Friday, April 1, in his first career opening-day start. Bob Geren kept his decision a secret all spring, although he apparently had made the decision during the offseason that Cahill was his guy on opening night. "Trevor was, in my mind, going to start Opening Day, if everything went well physically, for the entire offseason," Geren told MLB.com's Jane Lee. "I liked what he did last year. I liked his demeanor on the mound. The mental side of the game that he takes out there each time makes him ideal to start any game of the year. If there's a little extra hoopla and flyovers and fireworks on opening night, he's the perfect guy to handle that." While Cahill was the most likely choice for the No. 1 role following his 18-8 season last year (2.97 ERA), the A's had several candidates capable of filling the role in 2011. Brett Anderson has long been considered the eventual ace of the A's staff; Gio Gonzalez has had an incredible spring and is looking to build on his breakout 2010 performance; and Dallas Braden is the most experienced veteran on the staff and boasts last year's perfect game. But Cahill was the most consistent Athletics pitcher in 2010, and based on those contributions, he earns the honor of starting in front of a packed Oakland Coliseum on April 1. "He was obviously honored and happy to get that nod, but I also told him that all of our pitchers are very good," Geren went on to tell Lee. "They're all similar as far as age and experience, so I told him to not take it as any added pressure whatsoever. Take it as a compliment, but don't do anything different than if you were pitching the second game or the third or fourth. Just be yourself, and he completely understood and agreed with that." Cahill understands the added pressure and plans to approach the game as if it were just another start. "I think the goal is just to take it as any other start," Cahill told MLB.com. "I think, regardless, your first start of the season, everyone is going to have a little bit of adrenaline, so I just need to make sure that's in check." As a sign of maturity beyond his young age, Cahill also managed to take the news and stay grounded. "There are a bunch of guys to choose from. Everyone had a good year, so I think it's about lining things up. I know [Geren] feels confident in winning with whoever he puts out there, so I don't think it's a huge deal, just an honor more than anything." Along with Cahill, the rest of the A's rotation combined for a Major League best 3.47 ERA in 2010. 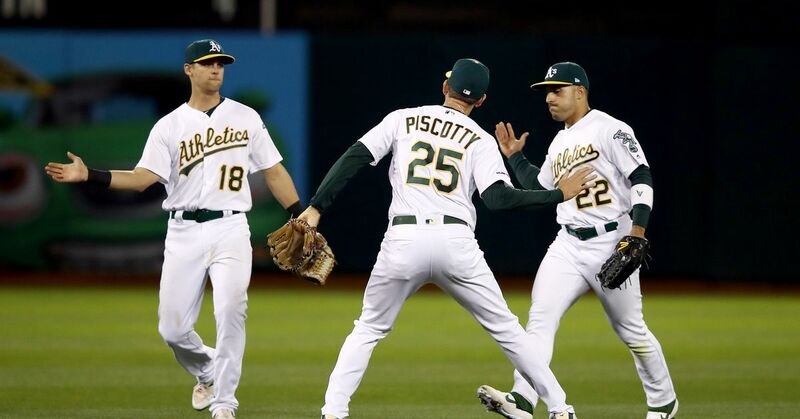 Offseason acquisitions to strengthen the lineup should help provide additional run support for the A's starters in 2011, as they look to improve on their 81-81 record and reach the postseason for the first time since 2006.